This recognized classic of modem astrology is truly a pioneering book. It established a new science of astrological psychology. It presents a language of energy that has enabled astrology to be widely and reliably used in the helping professions as well as by the general public. As Library Journal stated, “Transcending the boundaries of separate disciplines, this work represents a major distillation of astrological principles. This book relates astrology to modem psychology and explains the use of astrology as a practical method of understanding one’s attunement to universal forces. It clearly shows how to approach astrology with a real understanding of the energies involved. 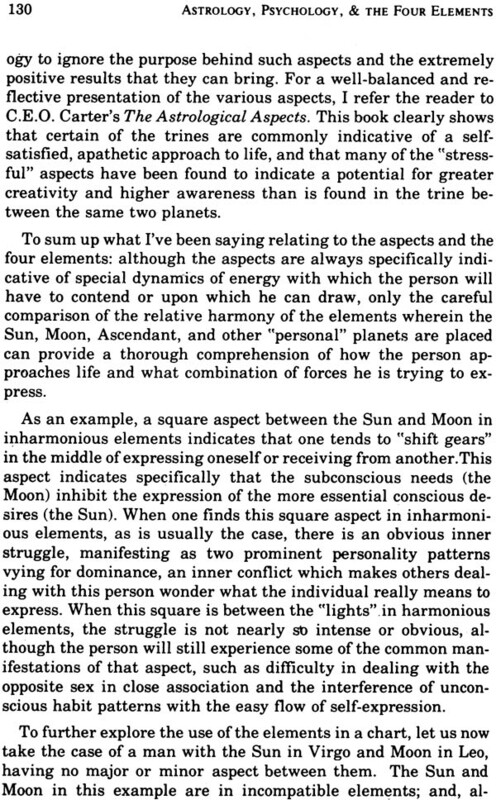 Part I of the book explains how astrology can be the most valuable psychological tool for understanding oneself and others. Analyzing the scientific, philosophical, and intuitive dimensions of astrology, it is oriented toward the layman with no astrological knowledge, astrology students and professionals, and those engaged in any form of the counseling arts. Part II deals specifically with the interpretation and practical application of astrological factors based on the actual energies involved (air, fire, water, & earth). It presents a dynamic application of astrological knowledge that clarifies and illuminates traditional techniques and meanings by placing them in the perspective of understanding the vital energies inherent in all life processes. STEPHEN ARROYO holds an MA Degree in Psychology and the California State License in Marriage and Family Counseling and for many years maintained a busy counseling practice. In addition, he has lectured at numerous international conferences and taught astrology and various healing arts. This book and his Astrology, Karma and Transformation are among the most highly acclaimed astrology books of modem times. In recognition of his leadership, he was presented the International Sun Award by the Fraternity of Canadian Astrologers. A new kind of astrology is being born at this time. It is still rather unformed, not totally coordinated, not fully adapted to social needs, and in need of a great deal of encouragement and support from its parents. Just as a baby falls many times in learning to walk, this new kind of astrology is having its ups and downs, and it occasionally falls flat on its face. Like all children, this growing entity requires concentrated attention from its parents in order to develop its potentialities to the full. And, al though a parent cannot sit back with satisfaction to contemplate a job well done until the child is fully healthy and self-sufficient, the very process of encouraging the growth and development of the child is incentive enough to continue the work. This now kind of astrology takes traditional theories and attitudes and turns them inside out, exposing at times a degenerated mass of contradictions and empty banalities, and at other times an inspiring essence of universal truth. The new kind of astrologer, therefore, roots out the imperfections and attempts to penetrate to a level of understanding that will illuminate an entirely new approach not only to astrology but also to man himself. The breakthroughs in the field of psychology made in the first half of this century are only now beginning to be assimilated into the mass consciousness, although they began to influence astrology as early as the 1930’s. It is only recently however that the process of assimilation has gained sufficient momentum that a great number of astrologers and astrology students are feeling the need to re-structure and re-define astrological traditions and the purpose of astrology itself. This restructuring process began with Dane Rudhyar’s The Astrology of Personality in 1936, and since then it has slowly gained speed and popularity. The development of this new kind of astrology has been so slow mainly because it takes many years for the mass consciousness to change and for astrologers to outgrow the old structure that they learned when first studying astrology. But the consciousness of the times has changed, and astrologers are slowly realizing that most methods of interpretation and practice that were appropriate for people in the 1920’s are irrelevant to people living and growing today. 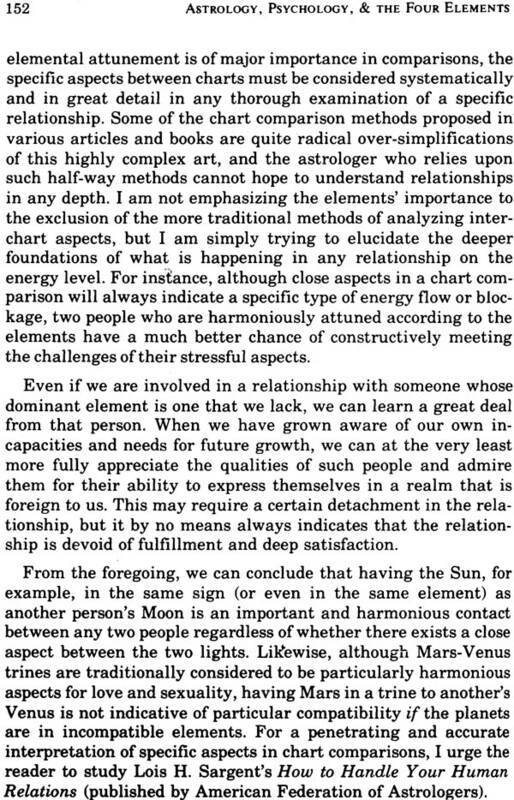 The specific ways in which this new astrology differs from the older methods are explained in this book in great detail, but I would like to emphasize one point. In most traditional forms of astrological practice, wherein the astrologer was essentially serving as a fortune-teller, it was assumed that the birth-chart revealed the circumstances that one would encounter in life and that these circumstances in the outer world were predictable and for the most part unalterable. However, it is obvious that the predictability of anything varies according to its level of complexity. For example, a simple animal cell or chemical compound is usually predictable since its nature is simple, since there few variables, and since it has no consciousness or capacity for alternative ways of reacting. The weather is less predictable primarily because there are many unknown variables, although it may still be predicted in many cases based on an understanding of known variable. A human being is least predictable because he has some degree of reason, will, and detachment, and because he is therefore capable of unlimited variable responses. And, as he gains more consciousness, he is even less predictable than before. Hence, a highly conscious person may need only an intimation of a possible event or experience in order to learn a certain lesson or to gain a particular insight, whereas one who is less conscious may need to experience a more definite and concrete outer circumstance in order to gain the same understanding. It seems to me that an individual is predictable precisely in proportion to his lack of conscious awareness. Hence, the new type of astrology to which I am referring is primarily oriented toward those who have taken some definite steps to gain increased self-knowledge. It is true that one is born with a certain birth-chart, with a certain pattern of “karma” or emotional-mental-physical tendencies. However, the circumstances that one will confront are to a large extent programmed by what one expresses. In other words, you get back what you put out; everything returns to its source. If one expresses impatience and self-righteousness, for example, he or she will automatically elicit such responses from others. It is useless to blame one’s birth-chart for one’s self-created misery. The emphasis in a modern, constructive use of astrology should be working with, modifying, or transmuting the natal energy attunement in order that the most positive expression of the energies can be manifested. I have tried therefore in this book to emphasize a deeper understanding of basic astrological factors and a deeper appreciation of the purpose of all astrological techniques. This book is written in two distinct parts. The first six chapters of Part I were originally included in a master’s thesis for an M.A. degree in psychology at California State University, Sacramento. The original thesis, before extensive editing, was awarded the 1973 Astrology Prize by the British Astrological Association as the most valuable contribution to astrology during that year. My main orientation in writing that section was to clarify various approaches to astrology and to reveal its practical utility, especially in ways directly related to the field of psychology. Although it was written primarily for those who are totally unfamiliar with the astrological point of view, students or practitioners of astrology can also benefit from it. For, not only does it contribute to a synthesis and deeper understanding of astrological premises, but it is also useful as an aid to answering the endless questions of the thoughtful general public or the prejudicial criticisms of the uninformed. Part II of the book provides a foundation for all astrological theory in terms of energy, through a systematic explanation of the ancient concept of the four elements. 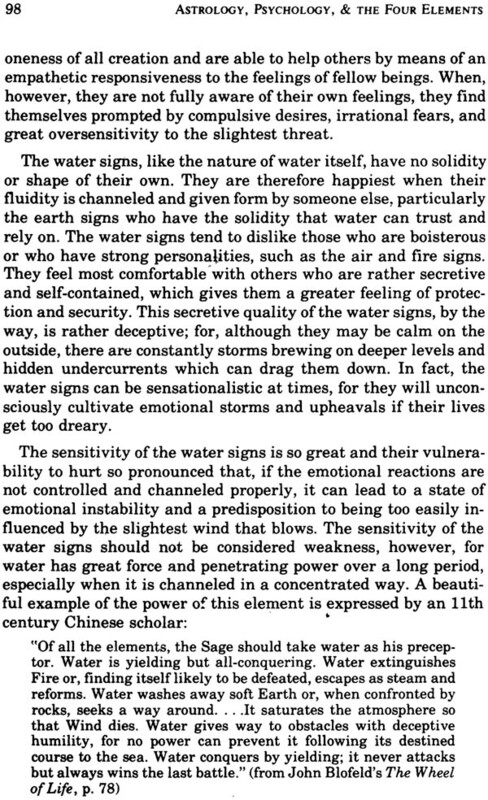 Since the elements describe the actual energies symbolized by astrological factors, an understanding of their principles enables one to synthesize the meaning of a birth-chart in a practical and immediate way. 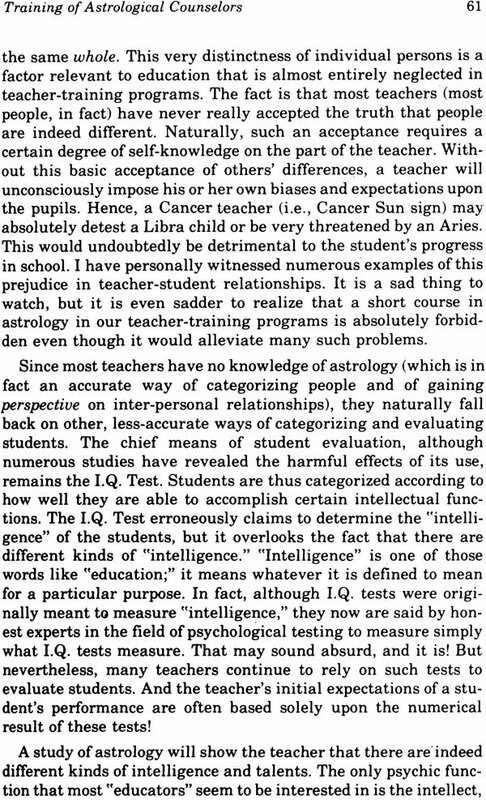 It seems to me that the biggest obstacle in a student’s learning astrology or in a practitioner’s ability to use astrology in a practical helpful way is the lack of synthesizing methods presented in astrological writings. There are so many beginning textbooks available nowadays, but only rarely does one find in print an explanation of how to penetrate to the core meaning of astrological factors or of how to see a simple pattern of order within the endless combinations represented in birth-charts. 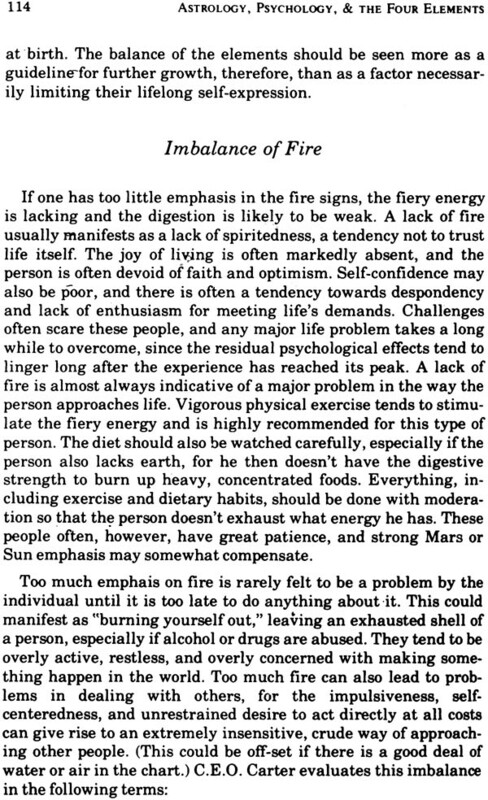 It should also be emphasized here that, since Part II deals mainly with the basic principle of the elements, it was necessary in many cases to realize in order to bring out the essential principle being discussed Readers should, however, be cautioned not to identify with only the Sun sign element (or indeed with any other one factor) in their charts as they procede through this volume. As I have tried to clarify in the book, each chart factor is an independent emphasis within the pattern of the whole, but a strong factor does not dominate the entire pattern to the exclusion of other points of emphasis. It should also be stated that, although the term “energy” may seem rather nebulous to some readers, our language simply does not provide more precise words. After all, light energy, if considered as an octave, is only one of about seventy-five octaves in the frequency ranges of the recognized electromagnetic spectrum. Attempting to describe transcendent energies with our limited language has been a difficult and challenging task, and I hope the reader will excuse any failure to communicate the rather subtle meanings involved. The approach that one assumes in studying any phenomenon is naturally based upon the purpose one has in mind, whether consciously or unconsciously. In other words, what one wants to do with one’s conclusions determines the approach taken. In this book, my purpose is to provide a background and a framework for understanding astrology in modern terms and to elucidate both the structure and the application of this science in relation to contemporary psychology, psychotherapy, and energy concepts. 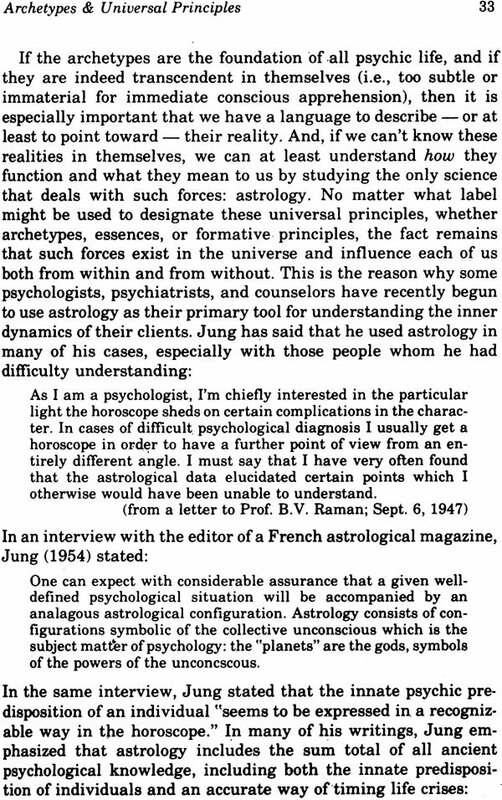 Hence, for the most part, I have omitted references to more “occult” or “esoteric aspects of astrology, not because I believe that such an approach is without value, but merely because it is beyond the scope of this work. In order that new ideas can prosper, we have to be free of “known” presuppositions so that a sense of wonder can illuminate our perception. Such freedom and openness is always a characteristic of true science. Clearing the ground of intellectual and emotional prejudices is necessary in order to achieve this freedom, and it is for this reason that I have herein devoted so many pages to a systematic critique of current “scientific” and psychological methods. Today, many people are seeking a more unified and comprehensive view of life than is available in the over-specialized disciplines commonly taught in traditional colleges and universities. There is a growing demand for a whole and satisfying participation with the cycles of life, and astrology can provide just that. As the physicist-philosopher L.L. 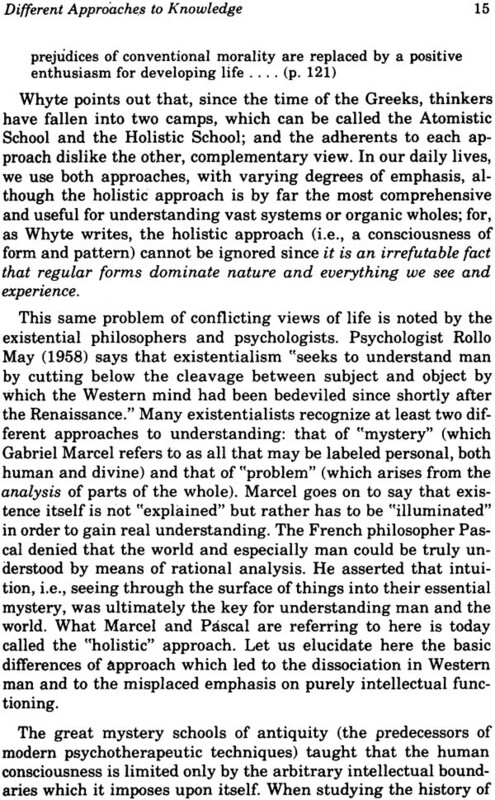 Whyte has written, “The deepest aesthetic and scientific principle lies in a tendency toward simplicity, order, elegance, form.” Astrology reveals the overall pattern of simplicity, order, elegance, and form that operates throughout the universe and, in particular, within every individual. Within the field of psychology, there are dozens of “theories of personality” which attempt to discover and define some semblance of order within the character and life-style of the individual. Every theory of personality assumes that there is such a thing as “human nature” which the new-born brings with him into this world, chiefly in the form of general predispositions and potentialities rather than specific traits. The problem with all the personality theories commonly utilized in psychology today is that each is inherently biased toward the sort of person who shares certain characteristics with the inventor of the theory. 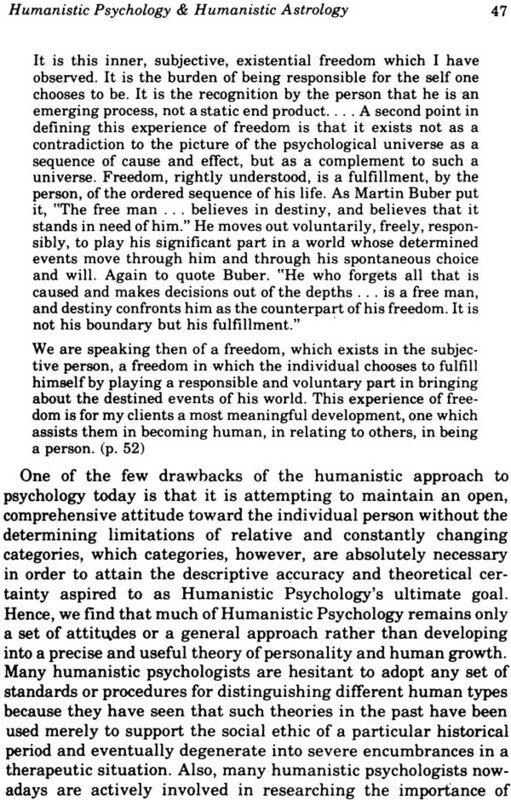 In other words, since the theoretician assumes that everybody is really like himself down deep, and since he has no cosmic framework to enable him to gain a broader perspective on humankind, the use of such limited and biased theories in actual practice has profoundly destructive effects. 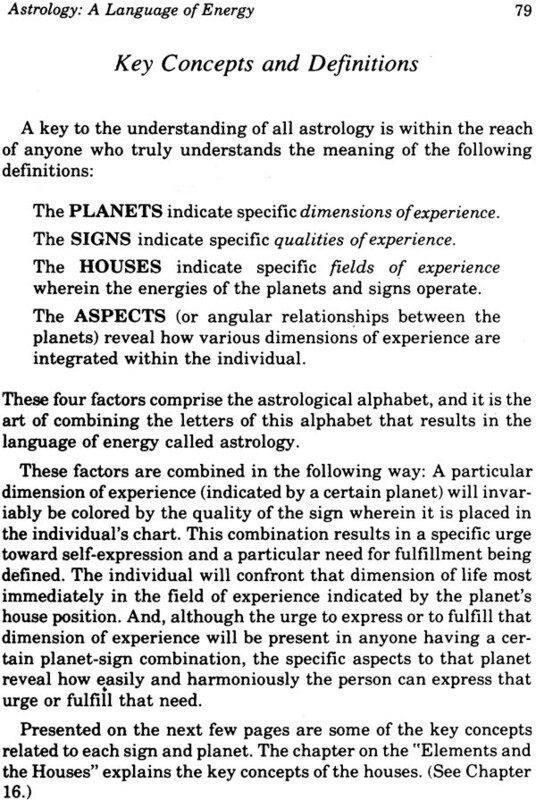 If however, as the evidence in this book indicates, astrology is indeed a language that describes the very energies that activate a human being, it could very well be the most accurate way we have of describing what is truly the “human nature” of each individual. After utilizing astrology extensively for the past nine years, this is certainly how it seems to me; and, over the past few years in my practice, I have gradually let all the other theories go by the wayside. To me, astrology is without a doubt the most accurate and comprehensive means of understanding human personality, behaviour, change, and growth. I have often been asked why astrology has witnessed such renewed popularity in recent years. I think part of the answer lies in the fact that Western culture no longer has any viable mythology to sustain it. Myth always serves as a vitalizing force in any culture by showing man’s relationship to a larger, more universal reality. People have always needed a pattern of order to guide their collective lives and to infuse their individual experience with meaning. 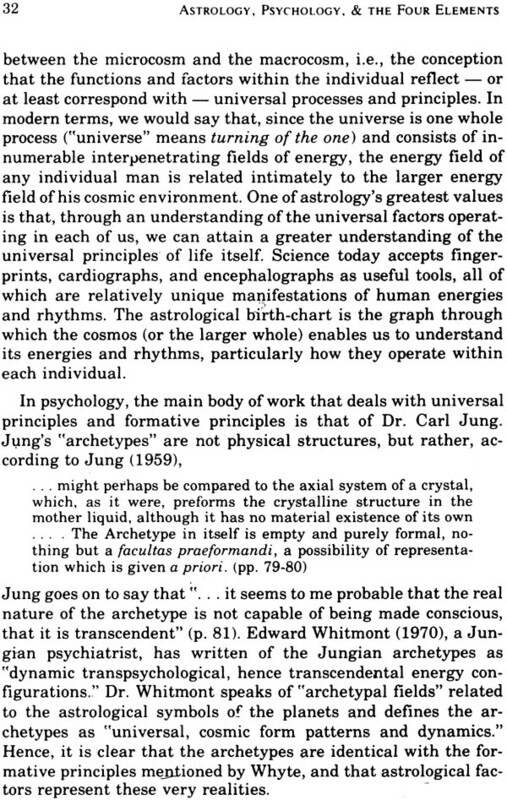 * In this sense, astrology comprises within itself an entire mythological framework. Professor Joseph Campbell writes that “Man cannot maintain himself in the universe without belief in some arrangement of the general inheritance of myth. In fact, the fullness of his life would even seem to stand in direct ratio to the depth and range not of his rational thought, but of his local mythology.” Campbell states that there are three essential functions of myth: “to elicit a sense of awe, to render a cosmology,” and “to initiate the individual into the realities of his own psyche” As so many people are discovering today, the proper use of astrology fulfills all these three functions. Hence, if we agree with Campbell’s definition of myth, I think we must agree that astrology, as it has for ages past, provides a vital and practical mythology for our times.